Thanks everyone for braving the heatwave to attend our PMQG meeting and a big heartfelt congratulations to our President, Kimberly Buckley, who was off “getting eloped!” Mazeltov! Erin Case, our guild VP for Technology and Social Media, stepped in to run the meeting. She announced that we are currently at 321 members and are the largest chapter of the MQG in the world! While that is exciting it also means we might need to find a bigger space to meet. Please let us know if you have ideas! We welcomed our new members and invited those who are PMQG curious to become members. We have half-year memberships for individuals, businesses and sponsors available now. Check out the New Member section of our website to learn more about our guild and the MQG. 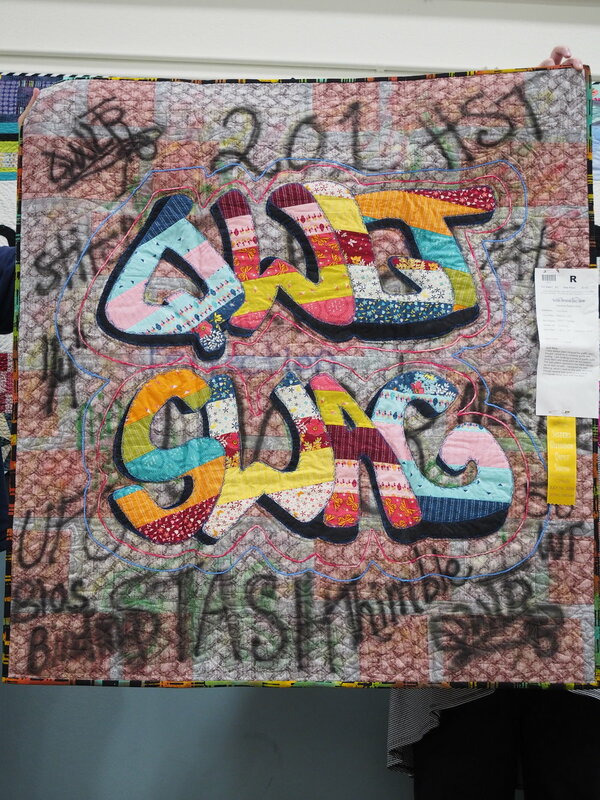 Our theme PMQG Special Exhibit for 2019 Sister's Outdoor Quilt Show is 'Rainbows.' Erin presented Color Wheel Quilts which explored inspiration for traditional and non-traditional versions. 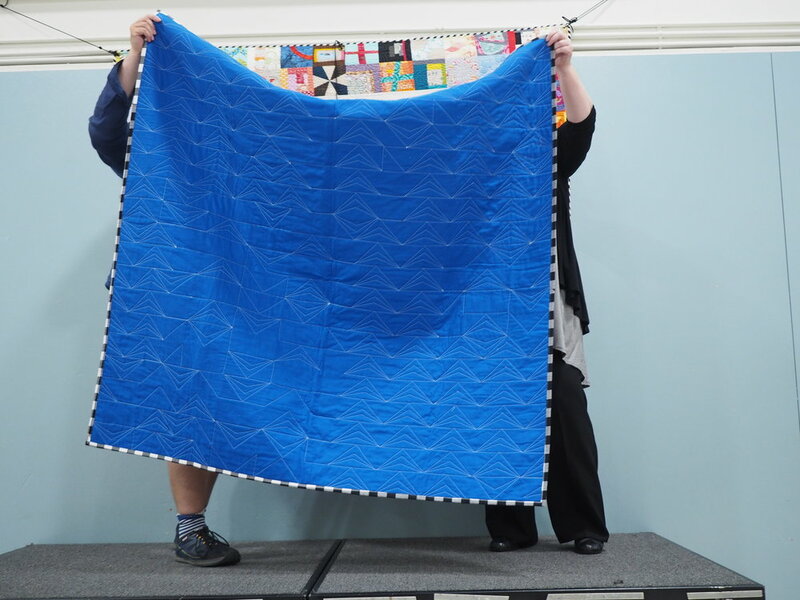 View all the Rainbow Quilt Challenge presentations and learn more about this special exhibit here. 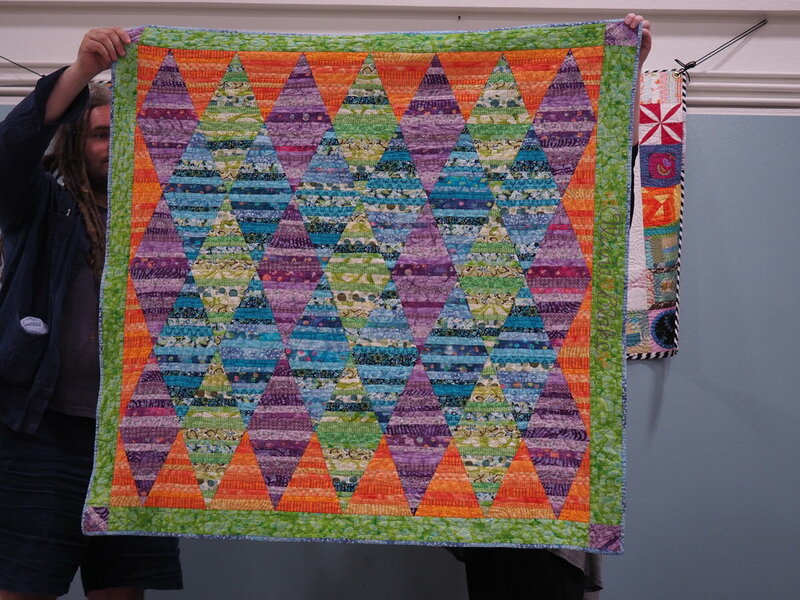 The PMQG Charity Program was productive in July, delivering 55 quilts to our designated charities. We always have Wonky Star block kits and quilts to quilt and bind. Join us on August 24 at Modern Domestic for our next Charity Sew Day. All members are welcome, and all you need to bring is yourself! Susan Beal, our guild Programs Coordinator, shared the exciting announcement that our first ever PMQG Charity De-Stash Sale raised $4,216 - half from sales and donations and half from a generous donor match! We applauded all volunteers, those who donated to the sale, and those who shopped for their efforts in making this event a huge success! We presented 'giant checks' for $2,108 to each of our recipients, Quinn Wilson from Raphael House, and PMQG member Allison Enrique from Butterfly Boxes. They each gave a presentation about their organizations and shared how these donations will benefit their programs and community. At the end of the meeting Susan announced that a member had recieved a corporate match, making our grand total $6,000! Does your company have a corporate match program? We are happy to keep this total growing! We have a robust workshop program planned through the end of the year. Indigo Dying with Anna Joyce in August is currently sold out (waitlist is available). There are a few spots left in Christina Cameli's Free Motion Quilting: Textures and Grids class on September 8. Waitlists are available for both of the Anna Maria Horner workshops in November and we broke our guild shopping record for Denyse Schmidt's workshops: Free Wheeling Single Girl workshop sold out in two minutes (there is a waitlist available) and there are a few spots available in her Woven workshop. Artist & Craftsman Supply in Portland, OR. At the break, Anna had lovely dyed garments available for sale as well as her Indigo Dye Kits and book, Stamp Stencil Paint. If you would like to purchase a signed copy of her book please email the guild. We have several copies for sale. Her newest book, Hand Dyed, A Modern Guide to Dying, will be out next March. 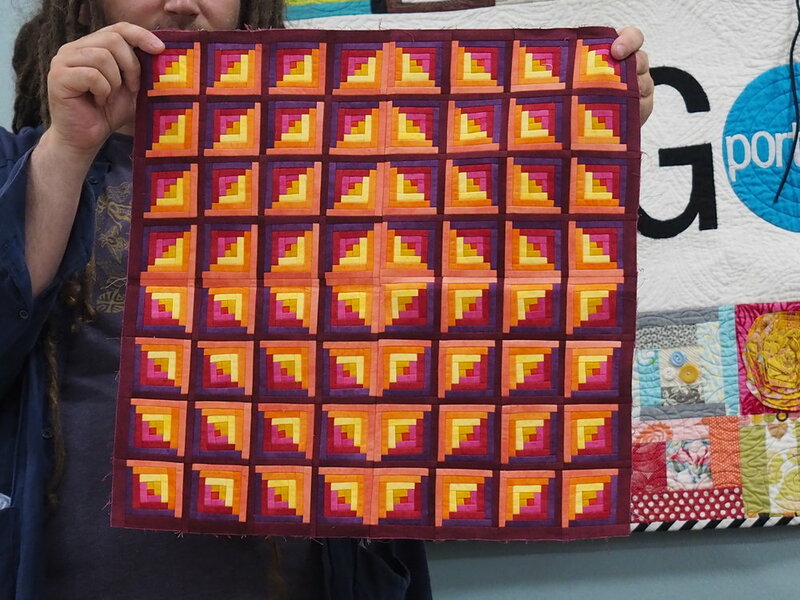 PMQG member Sam Hunter shared the Birdie Quilt that her mini group made that they will be raffling in November. Donations of women's underwear sizes XL - 4X and children's underwear sizes 6-12 will be the currency for raffle tickets. Their goal is to collect at least 700 pair which will be donated to the Raphael House. 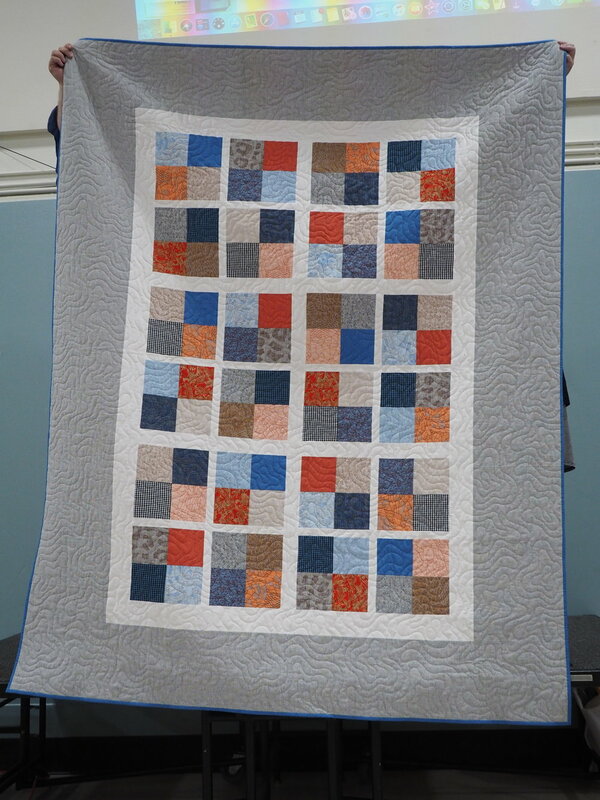 Kits to participate in making our PMQG Quilt Con Charity Quilt designed by Linda Nussbaum are available! Blocks are due back at our September meeting or October Sew Day. 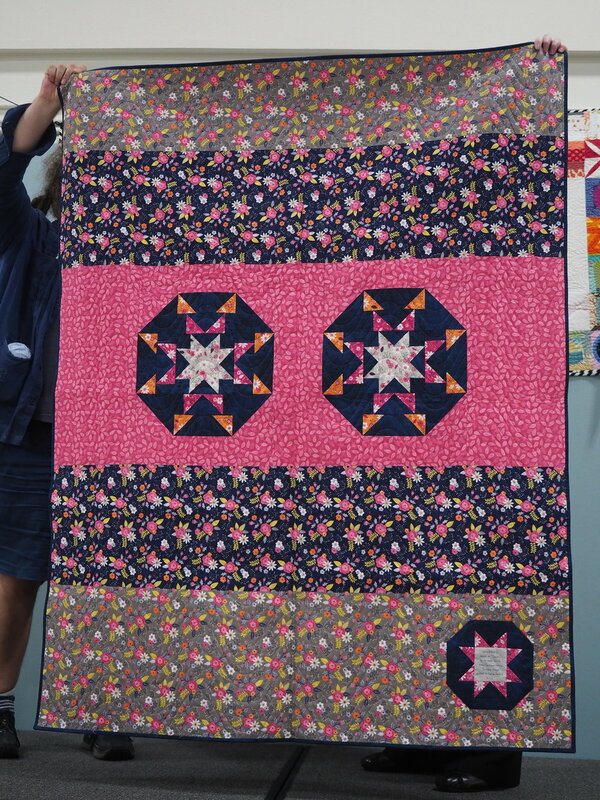 The Allison Glass Kaleidoscope Mini Quilt Challenge is well underway! 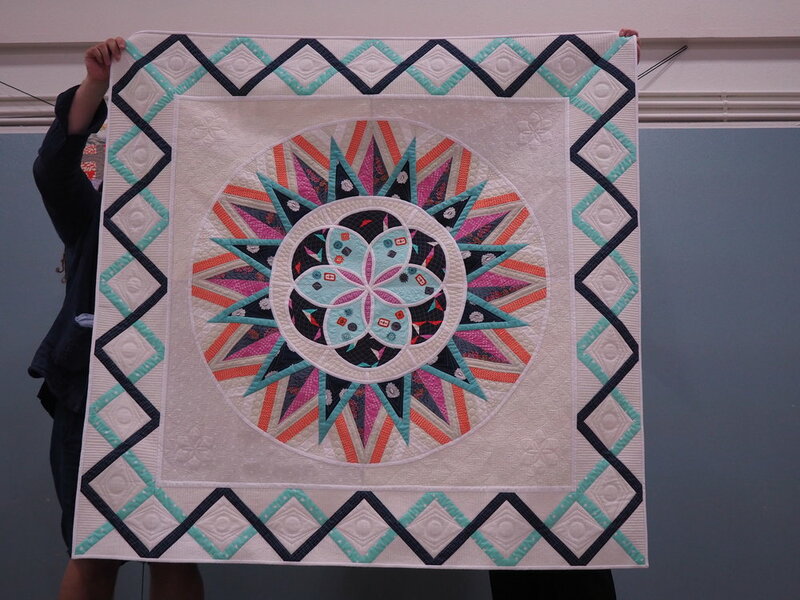 Check out #pmqgminiquiltchallenge2018 for sneak peeks at what our members are making. We are collecting any scraps and unused fat quarters to give to our members on the waitlist. We will have these at our next sew day. Our give-away winners this month were members Kory Keller, Marsha Mersky, and Terri Torke. Thank you to our generous sponsors and donors for your donations. Follow us on Instagram and Facebook to get the first look at our awesome give-aways prior to our monthly meetings. We tried a new way to sign up for Show and Tell this month in an effort to streamline the process and allow folks to sit and enjoy the show instead of standing off to the side in a line. What did you think? It appeared to run smooth and work like a charm square (quilt pun alert!) For those of you who weren't there, sign-ups are now paper-less and will be on our website and available the night of the meeting. Submissions are open for our second annual PMQG Showcase event this October. Submissions are open until September 20. Due to the size of the venue this will be a members only meeting. We are currently need of someone to donate/coordinate food for this event. Our next guild meeting is September 20. We will focus on generating ideas for how to make our 10th year super special. Start thinking about ideas for programs, venues, changes and improvements, and if you want to step in to one of the volunteer leadership roles. We are looking forward to this fun, interactive meeting.